L.B. Austin died Saturday morning at his home on Mission Hill after being confined to his bed for six months. IN 1840 he located in Cleveland, Ohio, and then moved to Iowa. 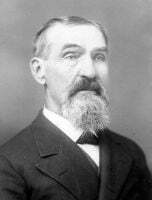 In 1849 he came to California, and was the Sergeant-at-Arms of the first Legislature in California. From 1851 to 1868 he lived in Nevada Co. In 1872 he located to Santa Cruz. He leaves a widow and daughter, Miss Anna Austin. The body will be shipped to Hollister tomorrow for interment. L. B. Austin was born February 20, 1819, in Addison County, Vermont. His father, Francis Brown Austin, was a native of New Hampshire. 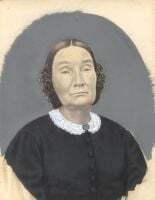 His mother, Eleanor Whitten, was also a native of New Hampshire. In 1833 the family moved to Oswego, New York, where they remained until 1838. In the spring of 1838 they moved to Indiana. In 1840 he went to Cleveland, Ohio, where he remained for two years. In 1842 he went to Iowa, where he engaged in furniture business, in the city of Burlington, remaining until 1849. He left Burlington with Captain Henry Niles' company for California. At St. Joseph the company received additions and thoroughly organized. They had no serious trouble with the Indians, and at Humboldt the company disbanded. He entered California August 16, 1849, through Bear Valley, passing Donner Lake, which had so recently been the scene of the Donner party's sufferings. Hearing that carpenters were in great demand at Fremont, Yolo County, he went there, 1851, he went to Nevada County, where he remained until 1868, when he went to Hollister. In 1874 he moved to Monterey, and in 1877 came to Santa Cruz. [S8] 1850 United States Federal Census, Ancestry.com, (Provo, UT, USA: The Generations Network, Inc., 2005), Online publication - Ancestry.com. 1850 United States Federal Census [database on-line]. Provo, UT, USA: The Generations Network, Inc., 2005.Original data - United States of America, Bureau of the Census. Seventh Census of the United States, 1850. Washington, D.C.: National Archives and Records Administration, 1850.M432, 1,009 rolls. Fremont, Yolo, California, roll M432_36, page 185, image 378. [S342] Santa Cruz County History Journal, Issue Number 4, (ISBN 0-940283-10-7), Austin, Levi Brown, P 38. [S601] Pacific Coast Business Directory. [S250] History of Santa Cruz County, E. S. Harrison, (Pacific Press Publ. Co., San Francisco, 1891), In 1833 the family moved to Oswego, New York, where they remained until 1838. In the spring of 1838 they moved to Indiana. [S250] History of Santa Cruz County, E. S. Harrison, (Pacific Press Publ. Co., San Francisco, 1891), In 1840 he went to Cleveland, Ohio, where he remained for two years. In 1842 he went to Iowa, where he engaged in the furniture business, in the city of Burlington, remaining until 1849. He left Burlington with Captain Henry Niles' company for California. At St. Joseph the company received additions and thoroughly organized. They had no serious trouble with the Indians, and at Humboldt the company disbanded. [S250] History of Santa Cruz County, E. S. Harrison, (Pacific Press Publ. Co., San Francisco, 1891), He entered California August 16, 1849, through Bear Valley, passing Donner Lake, which had so recently been the scene of the Donner party's sufferings. Hearing that carpenters were in great demand at Fremont, Yolo County, he went there. In May, 1851, he went to Nevada County, where he remained until 1868, when he went to Hollister. In 1874 he moved to Monterey, and in 1877 came to Santa Cruz. [S396] Directory for 1856, Brown & Dallison, p 51: Austin, LB, Proprietor Selby Flat Hotel. [S343] Edwin F Bean, (Daily Gazette Book and Job Office, 1867), Page 137, Col 2, â€œAustin, L.B., miner, Selby Flatâ€�. [S601] Pacific Coast Business Directory, Stationersâ€¦--Austin, L. B. Monterey. [S220] Santa Cruz County Directory 1878, (L.M. McKenney & Co, San Francisco, 1878), L.B. Austin & Co, groceries, Pacific Avenue., p. 206. [S346] Santa Cruz County Directory 1879, (L.M. McKenney & Co, San Francisco, 1879), p 405, â€œAustin, LB, Res Washingtonâ€™. [S249] Leon Rowland Collection, Leon Rowland, (Collection of cards and histories by Leon Rowland), L. B. - 1888 member SCPS; b.Vt.,to Cal in1849;, died Feb.13, 1897; aged 78; buried in Hollister., [SCPS = Santa Cruz County Society of California Pioneers -Ed. ], Box A-1, Card #224. [S344] (FM Husted), Austin, Levi B, Groceries & Fruits, 96 Soquel, res 78 Cayuga. [S249] Leon Rowland Collection, Leon Rowland, (Collection of cards and histories by Leon Rowland), L.B. Austin died in Santa Cruz Feb. 13, 1897. [S732] L. B. Austin, L.B. Austin died Saturday morning at his home on Mission Hill after being confined to his bed for six months.